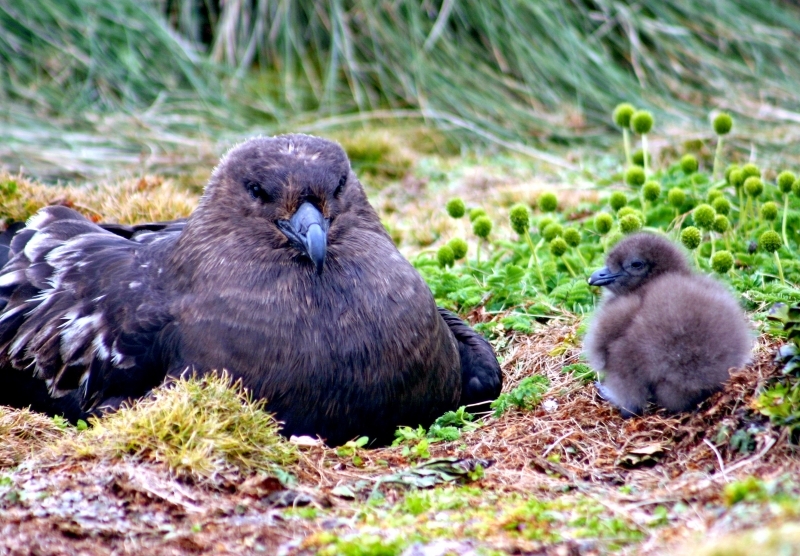 Large, heavily built seabirds, Skuas breed on most of the southern islands and may be distributed as far north as the subtropics. 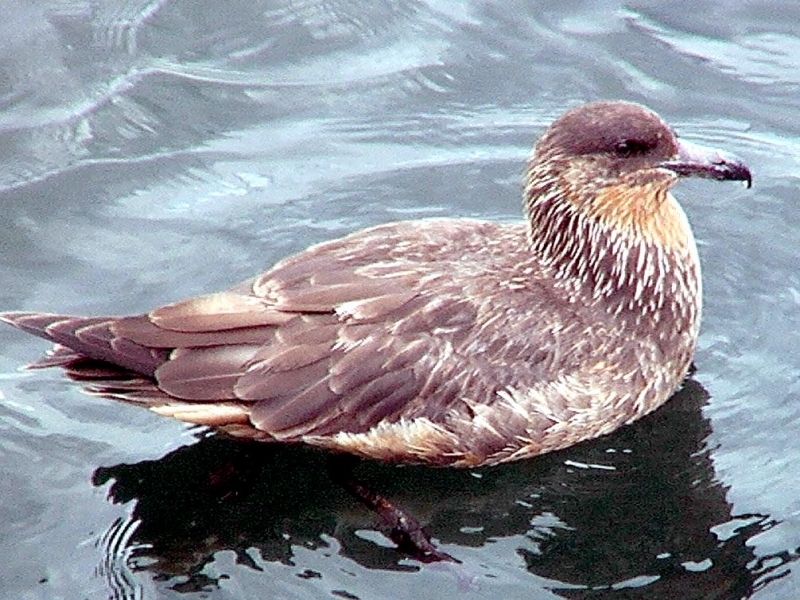 The English word comes from the Faroese name skúgvur for Skua with the island of Skuvoy renowned for its colony of that seabird. 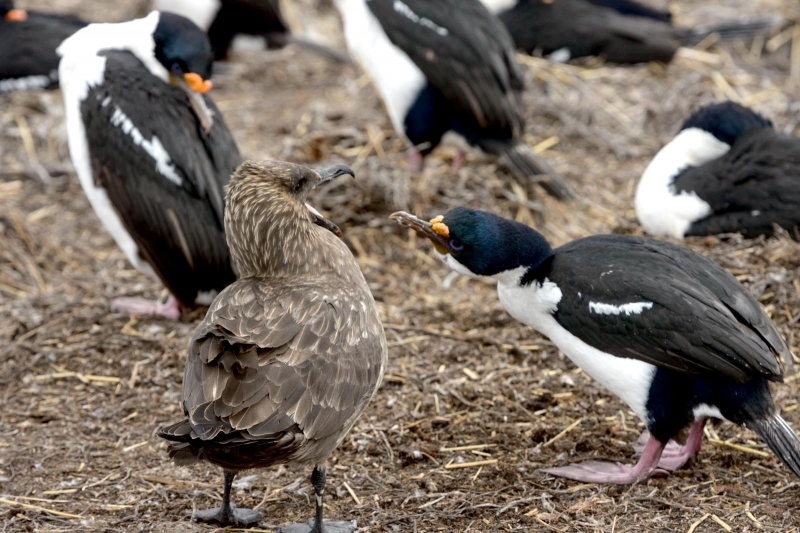 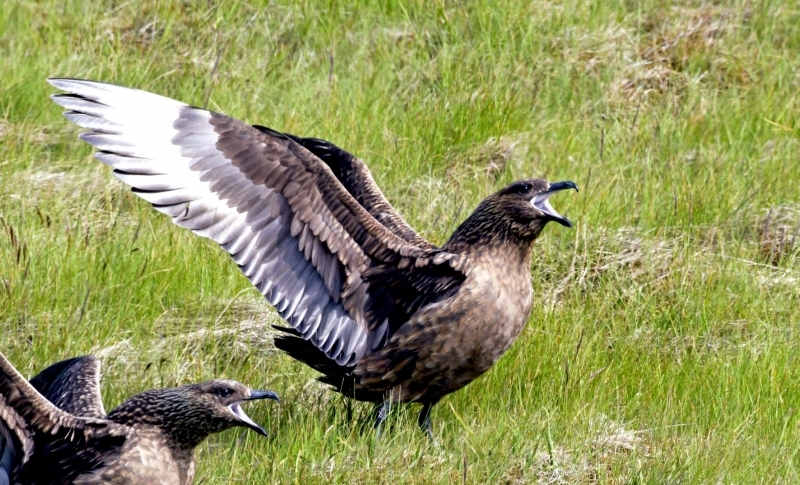 The general Faroese term for Skua is kjógvi. 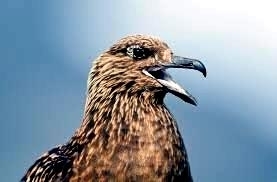 The word “jaeger” is derived from the German word Jäger, meaning “hunter”. 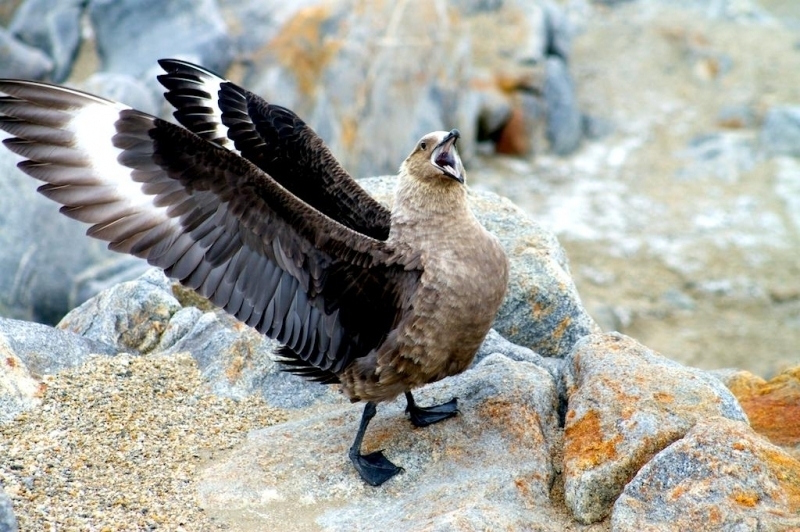 Skuas occur primarily on the Antarctic continent, although sightings have been recorded as far north as Greenland and the Aleutian Islands. 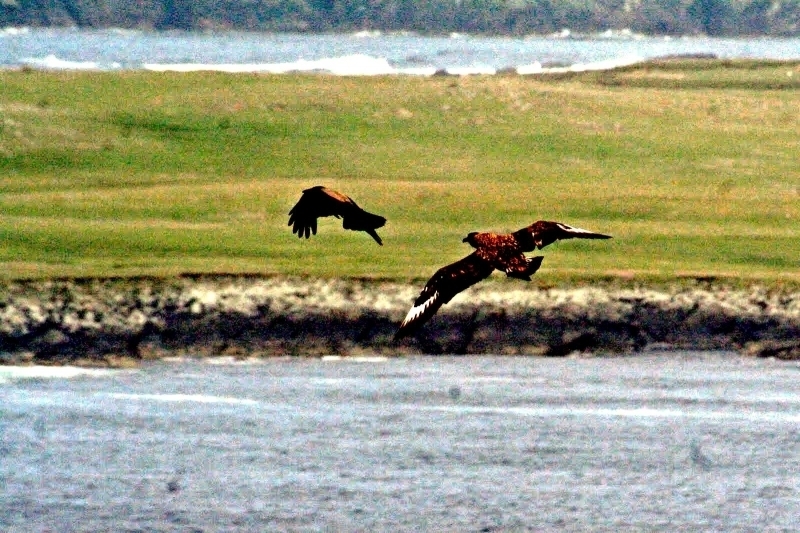 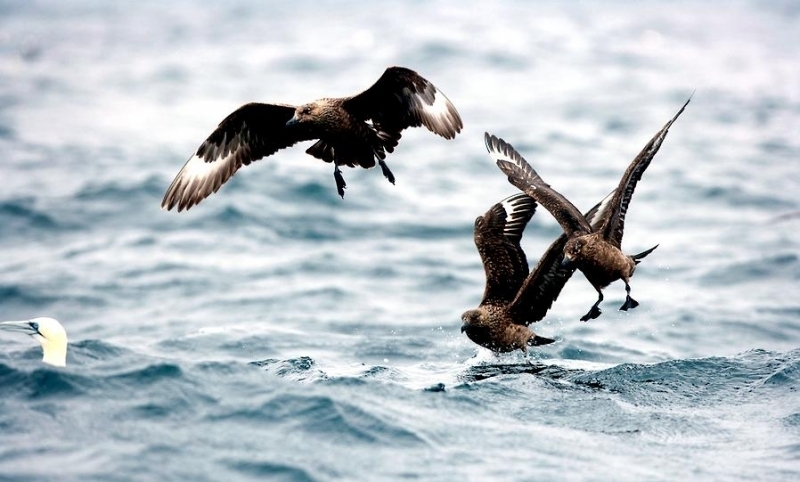 Skuas are often seen following ships at sea. 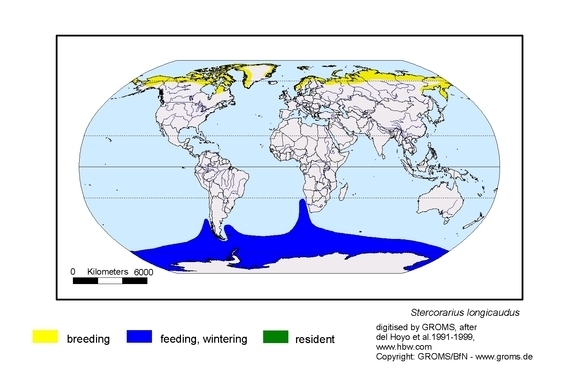 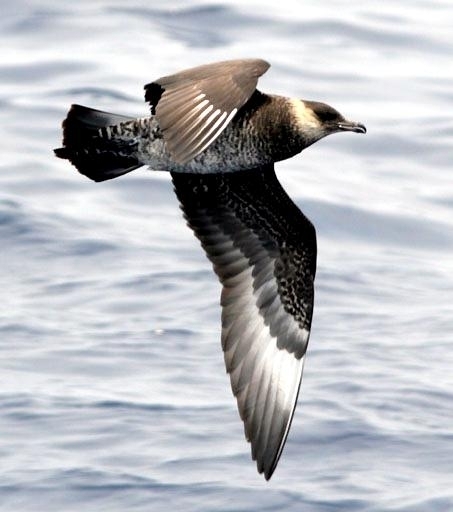 In winter after the breeding season, they migrate northward spending most of their time at sea. 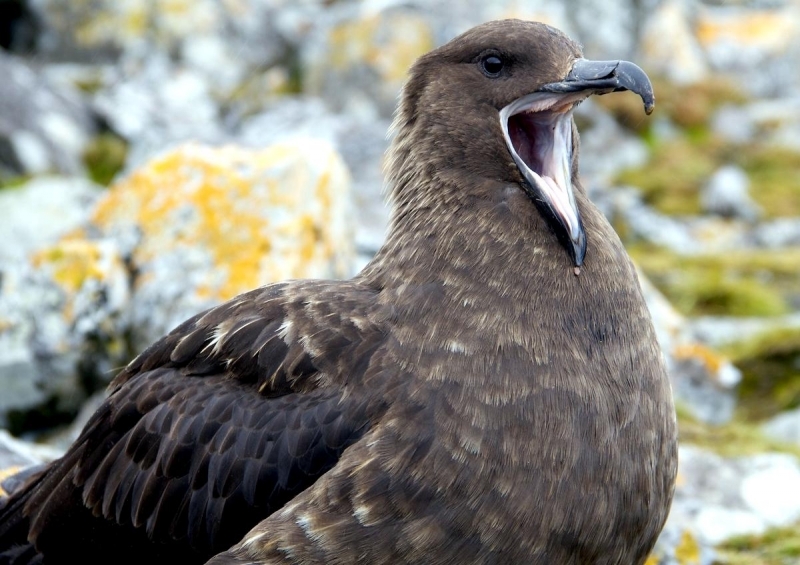 In appearance, Skuas look like immature gulls although heavier, more robust & menacing in behavior. 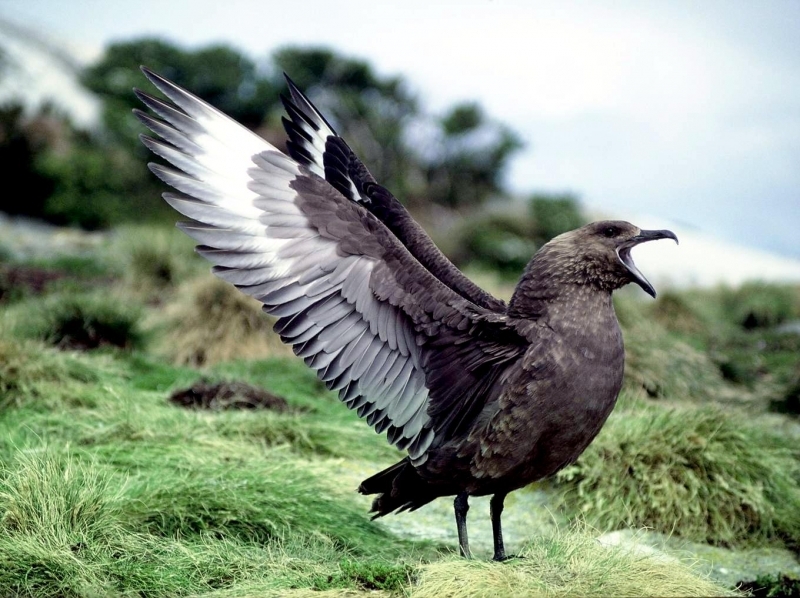 They have conspicuous white patches at the base of their flying feathers, wedge-shaped tails and a black, short heavy bill. 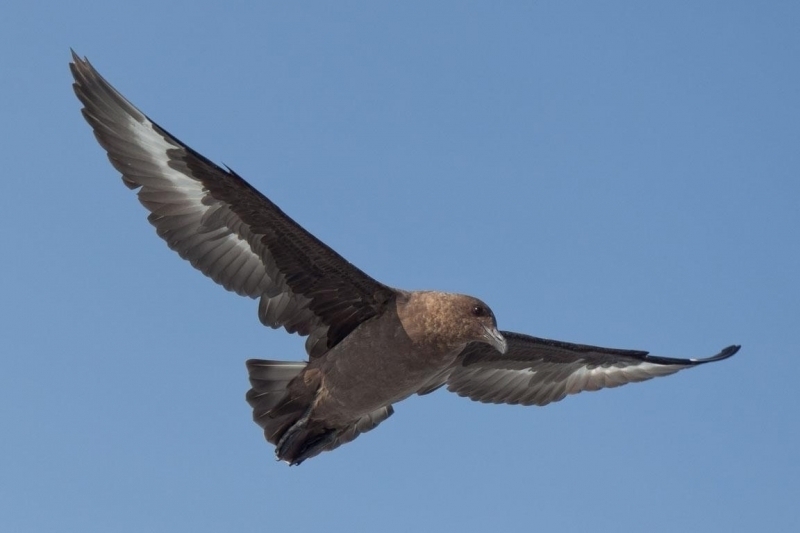 Their flight is heavy, with relatively little gliding and much flapping and their estimated lifespan is approximately 11 years. 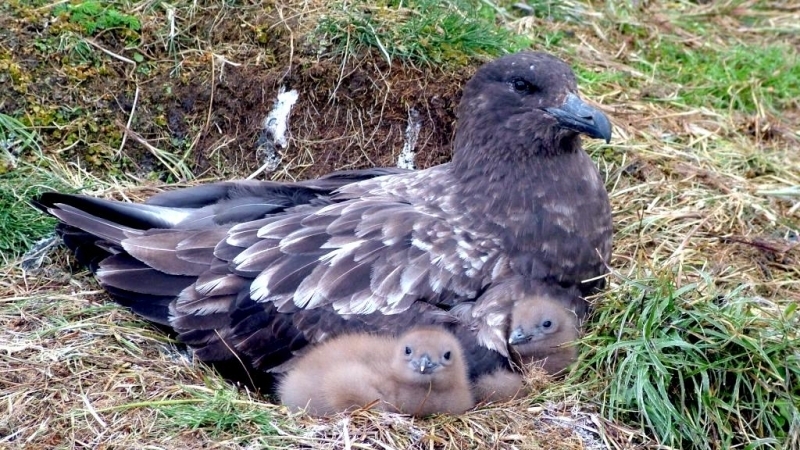 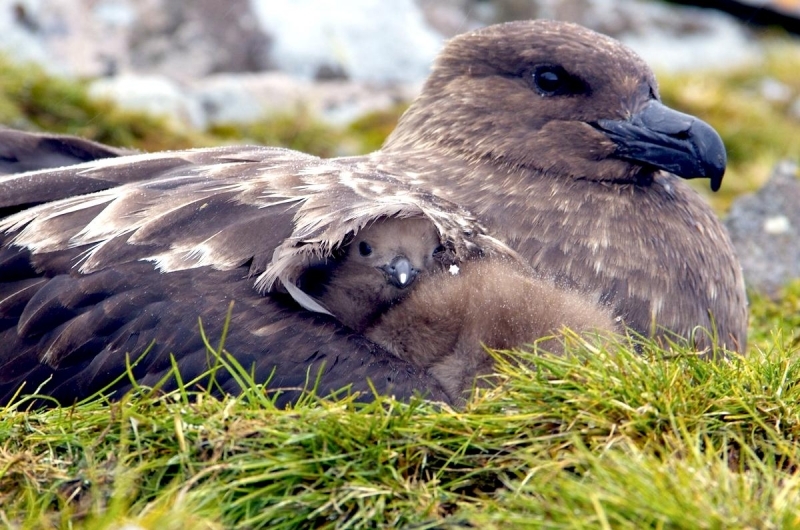 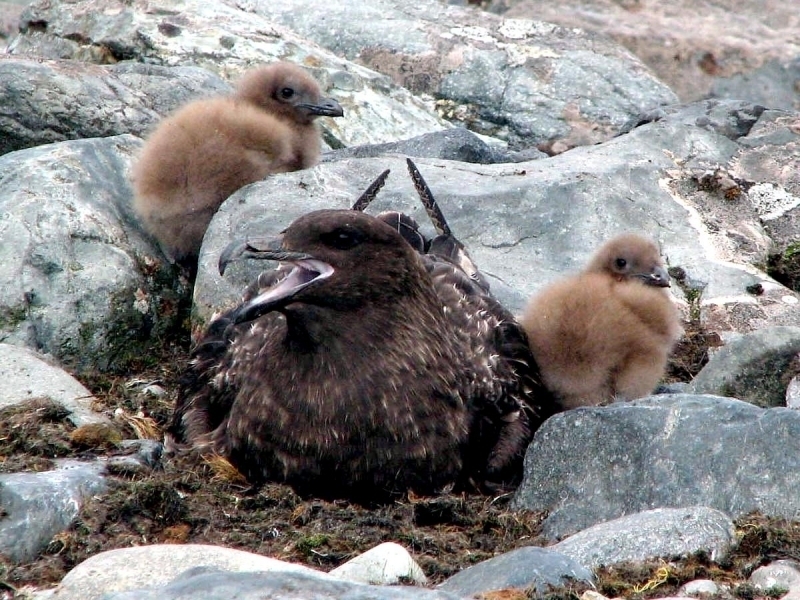 Fiercely predatory, Skuas also breed during the summer months, typically laying two eggs in nests located on elevated grasslands or in sheltered rocky areas in close association with prey species. 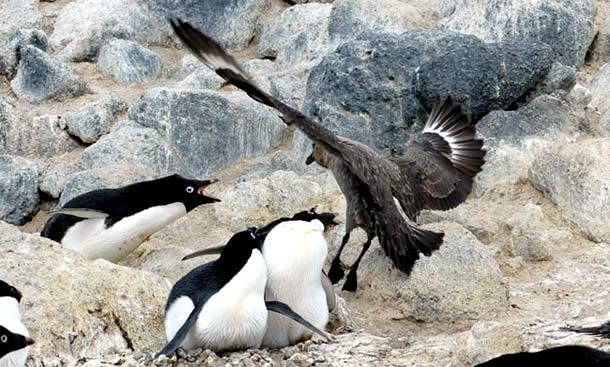 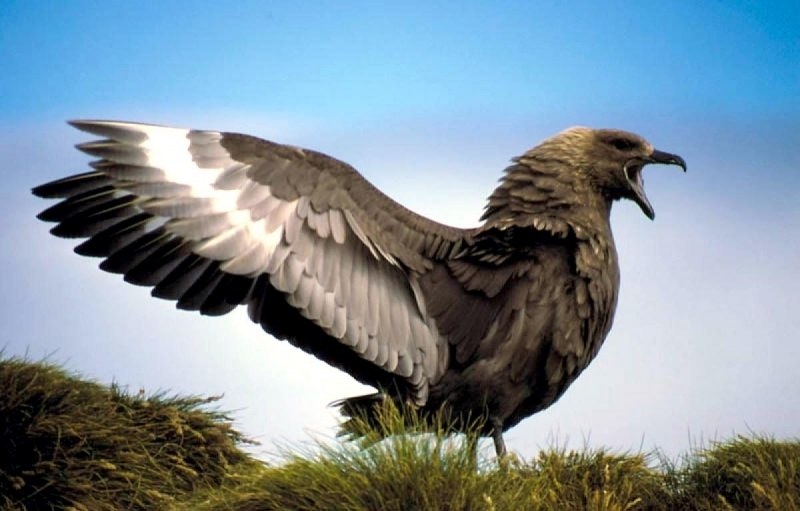 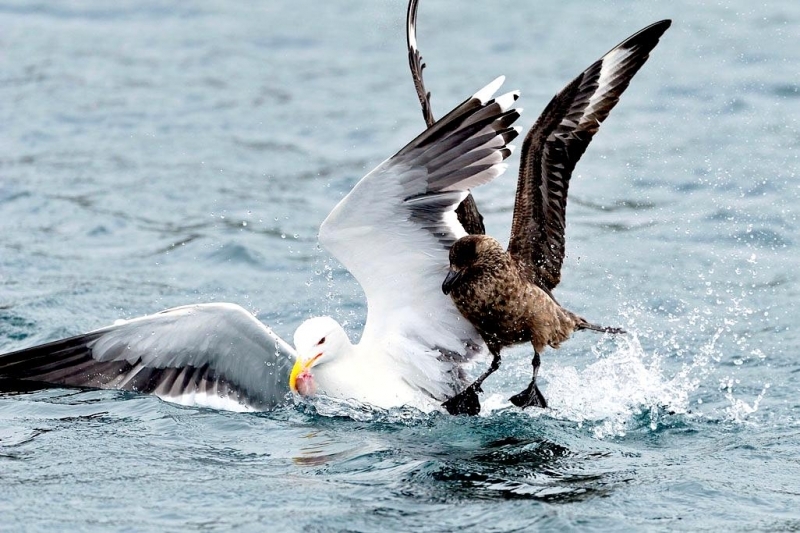 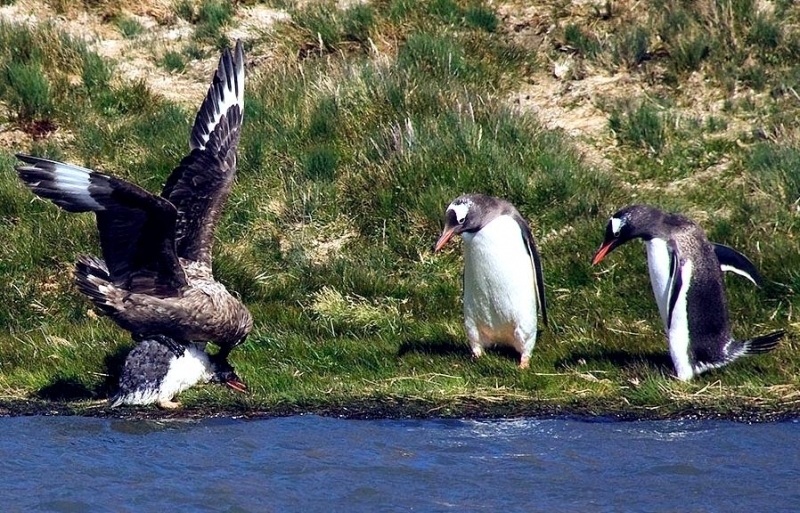 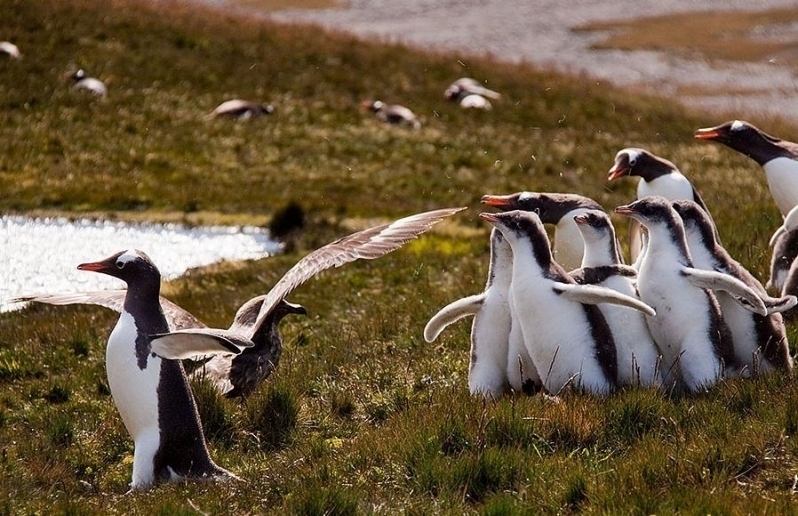 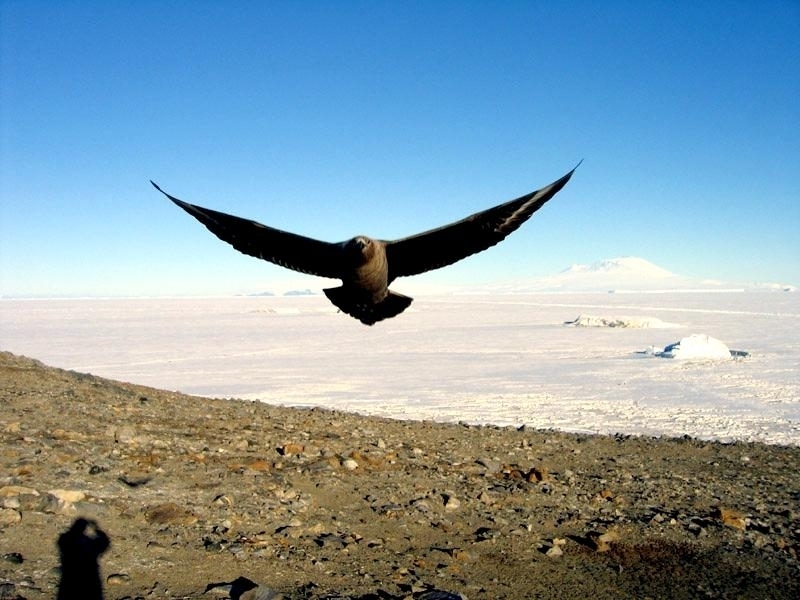 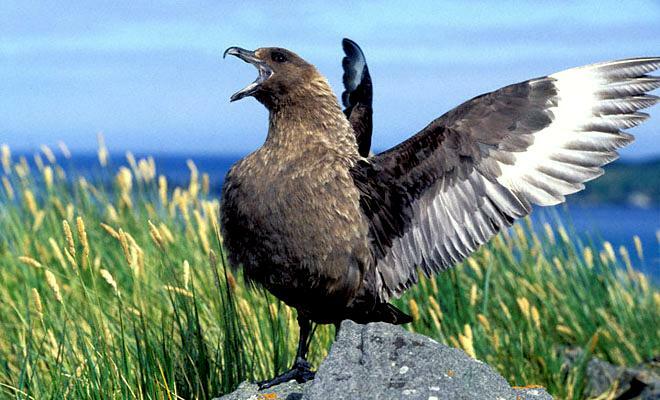 They will defend their territories vigorously against all intruders including other Skuas and Giant Petrels. 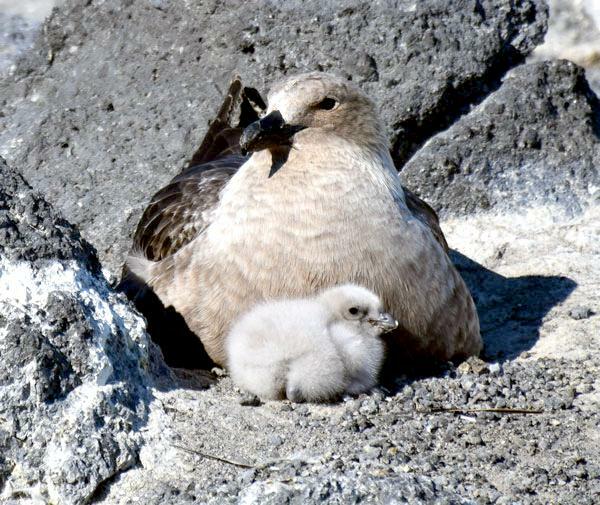 Some birds choose not to nest in the colonies, but will establish solitary nesting sites. 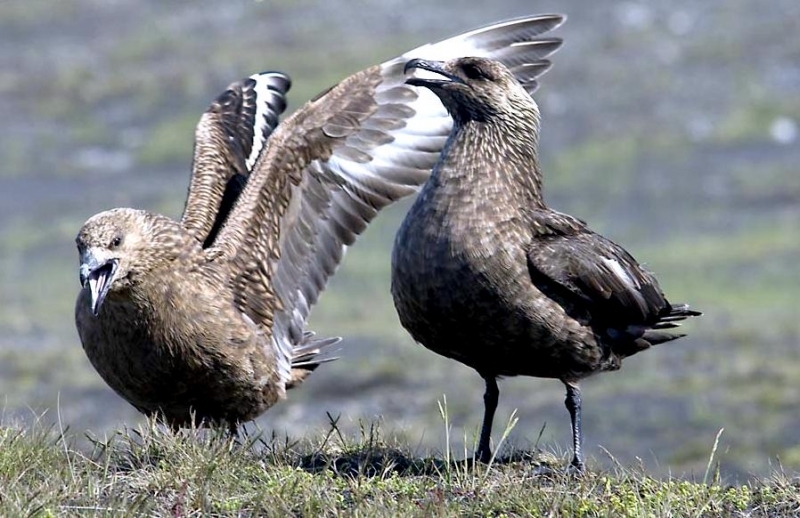 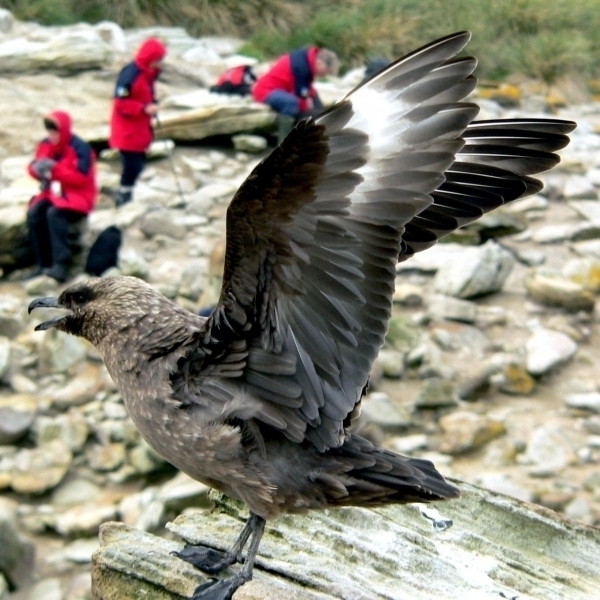 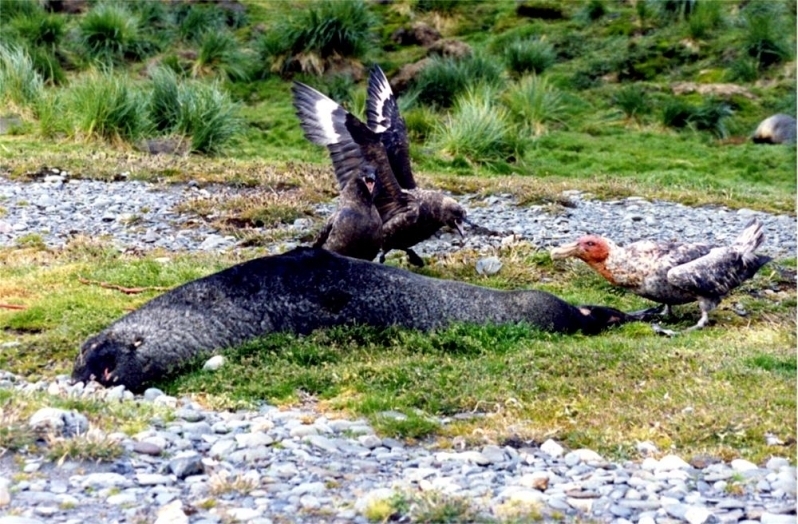 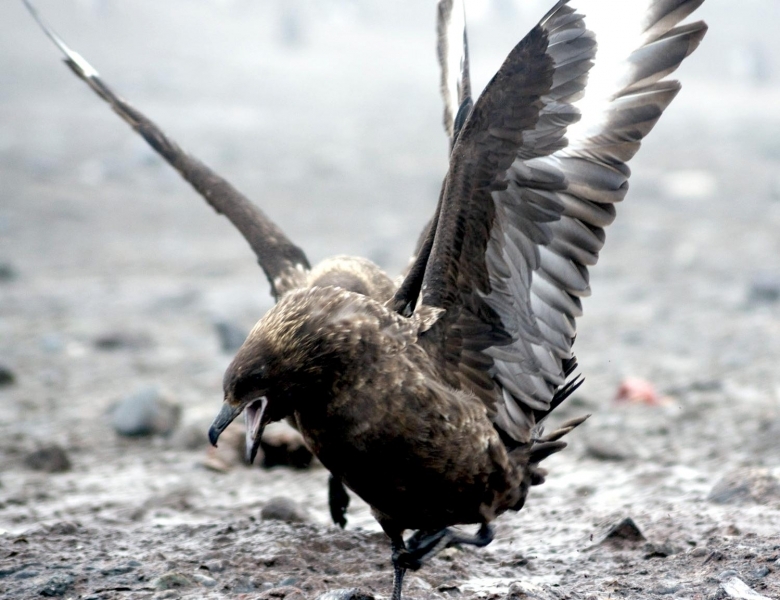 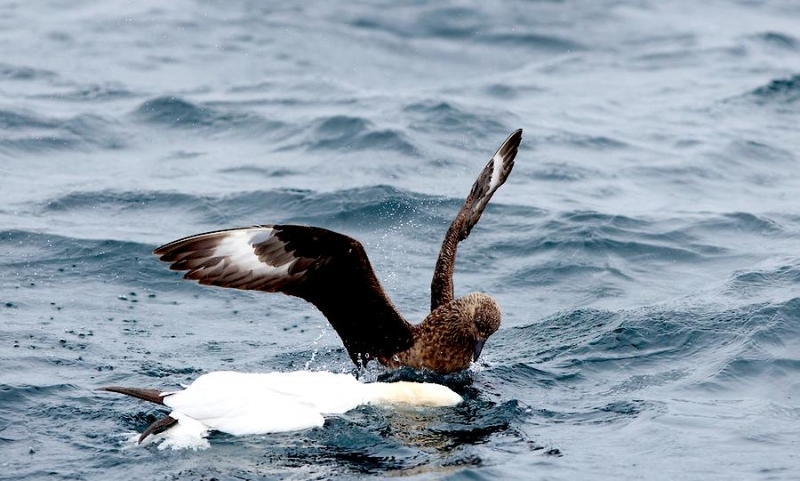 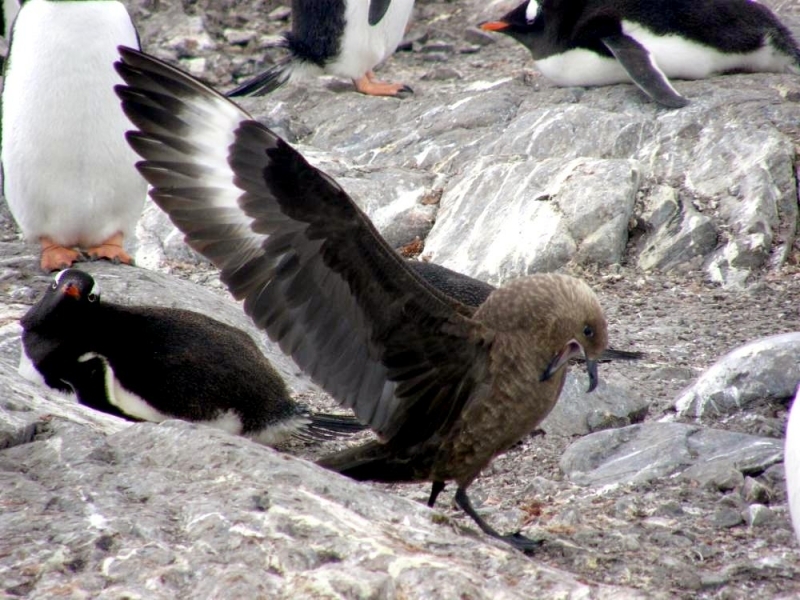 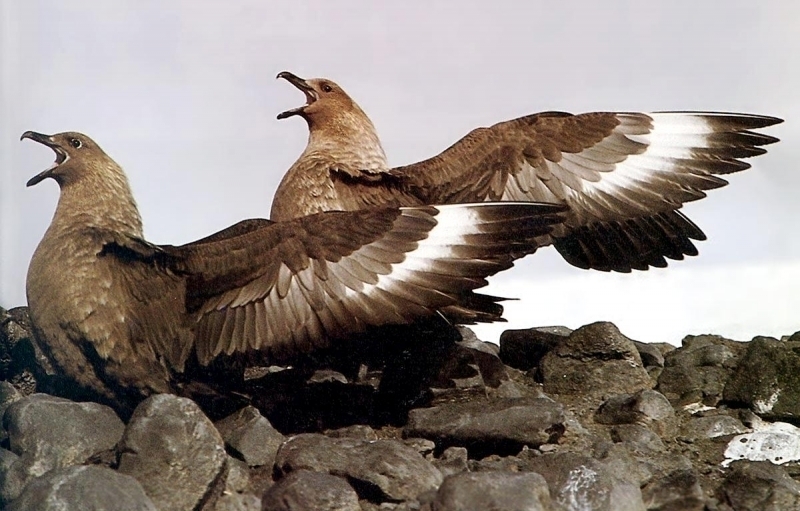 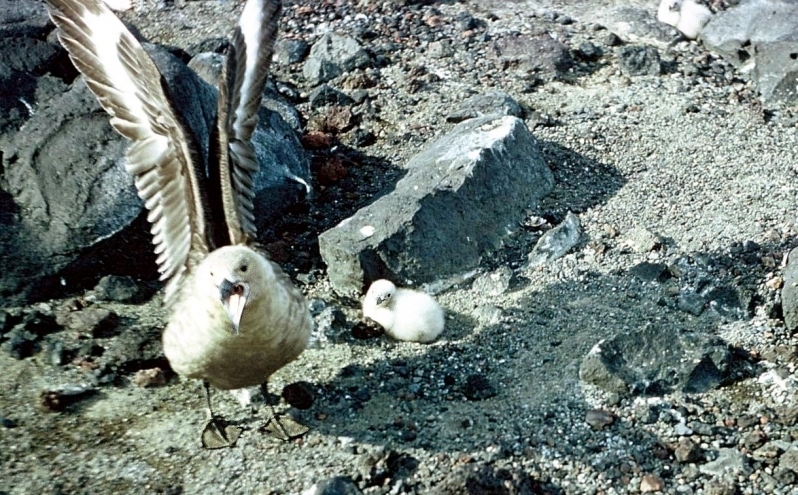 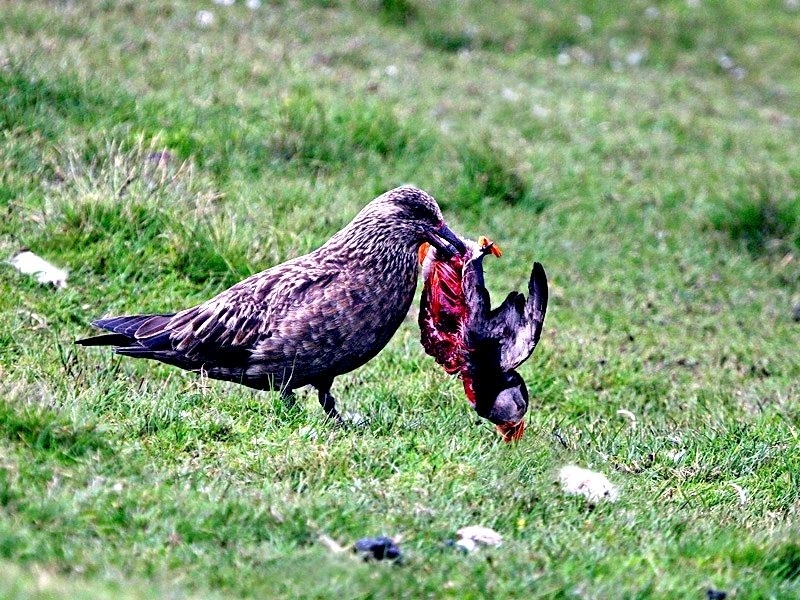 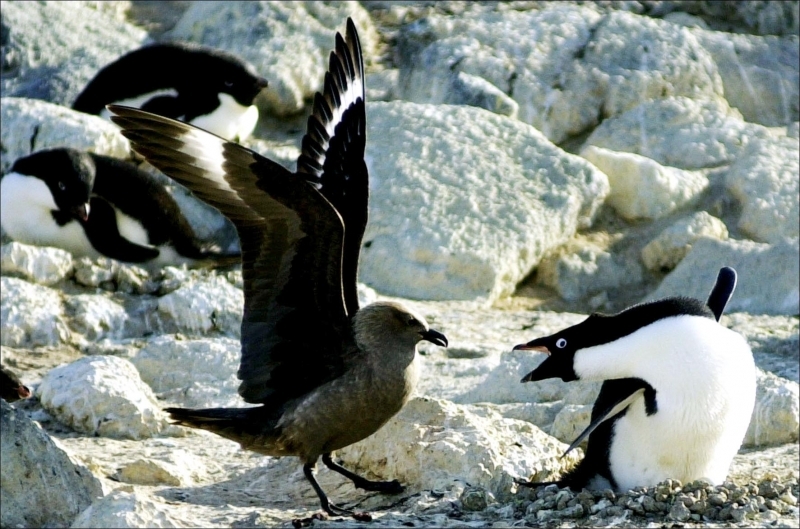 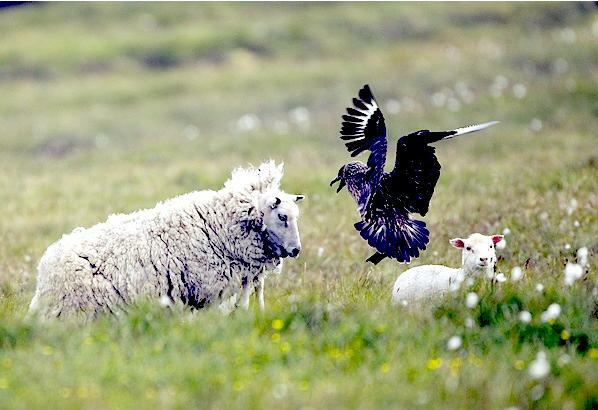 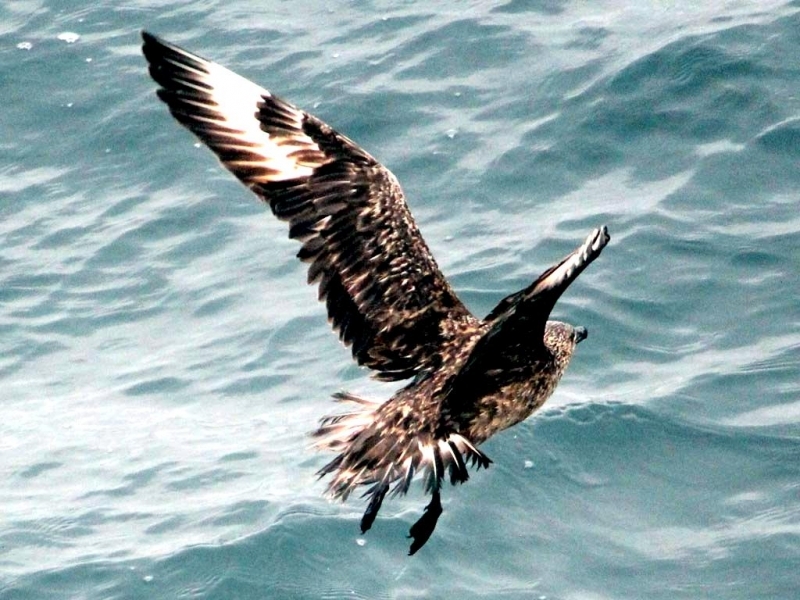 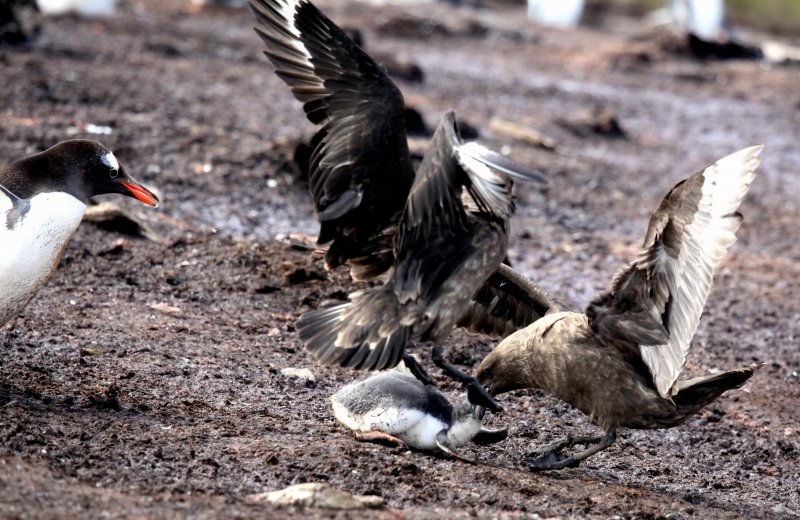 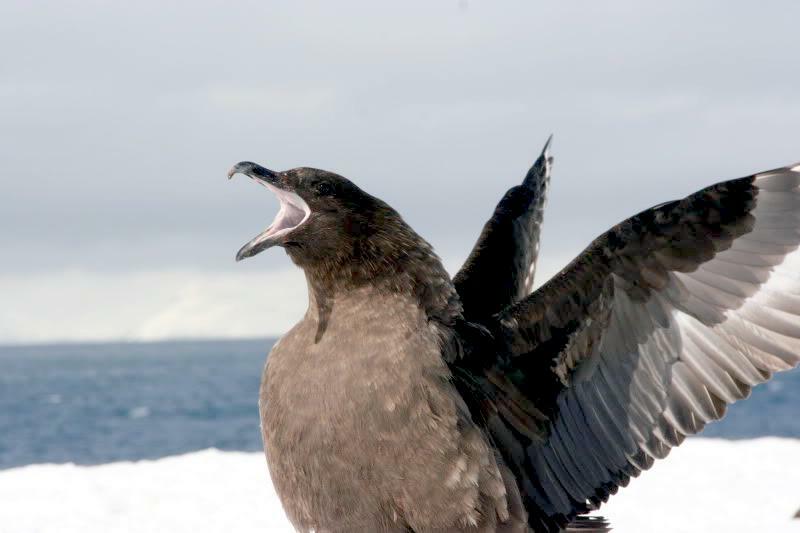 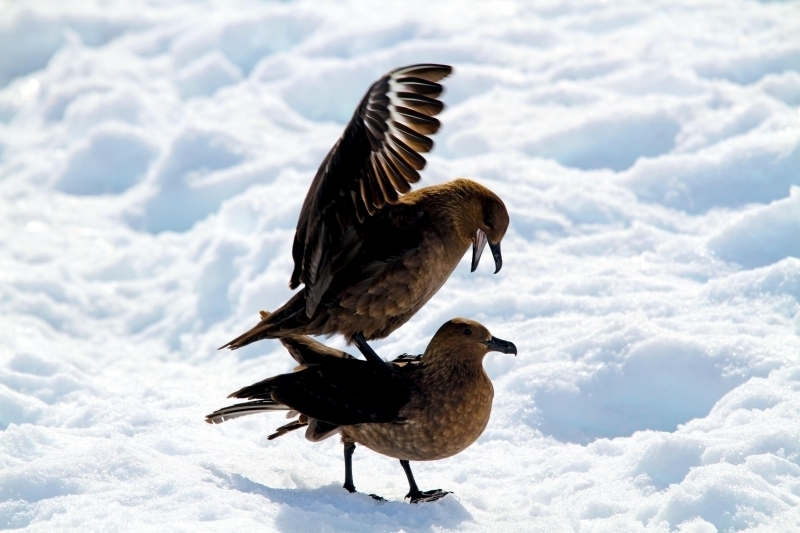 Breeding Skuas are highly territorial and will attack unwelcome intruders to their nests by flying straight for the head with claws outstretched. 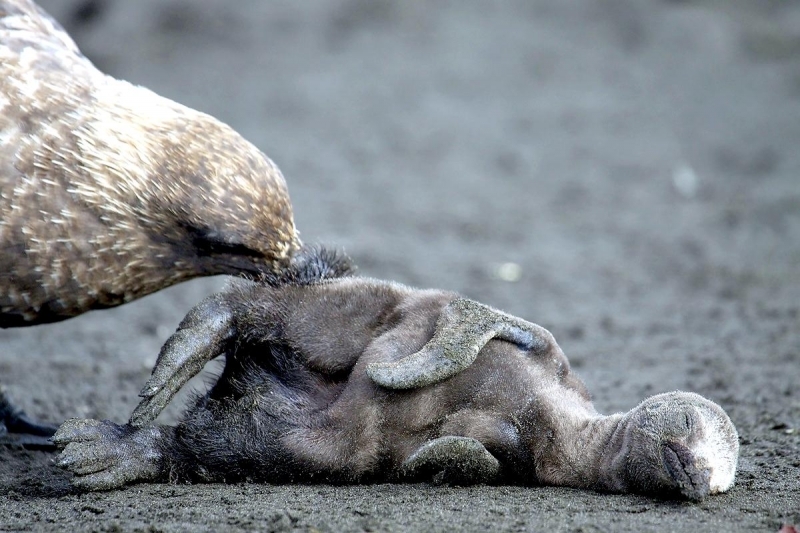 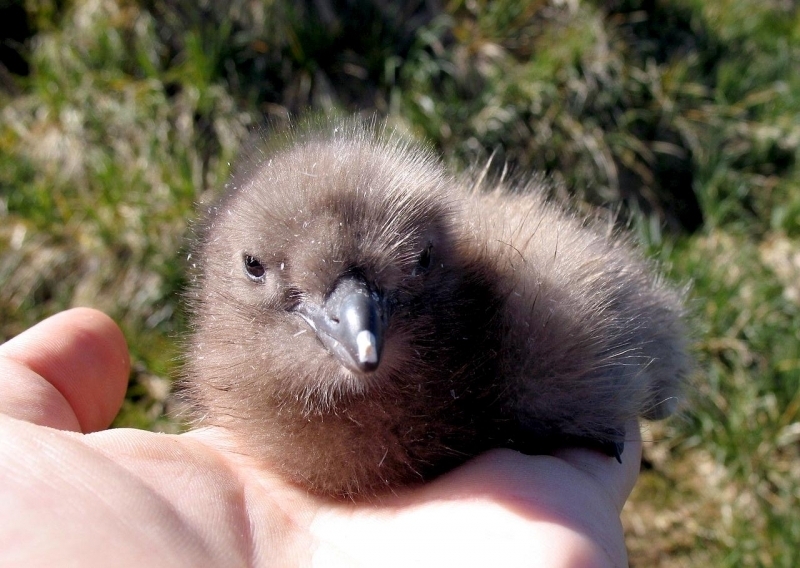 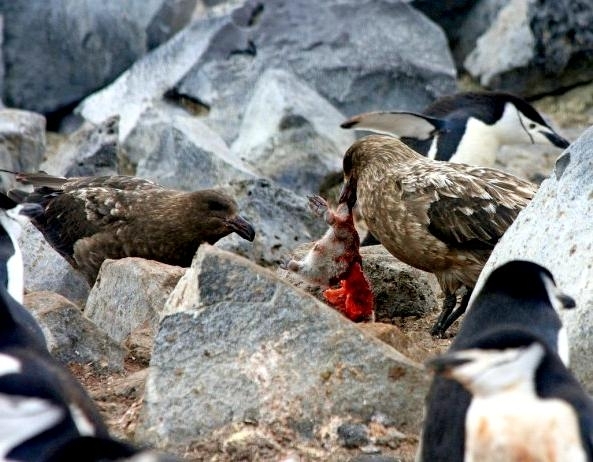 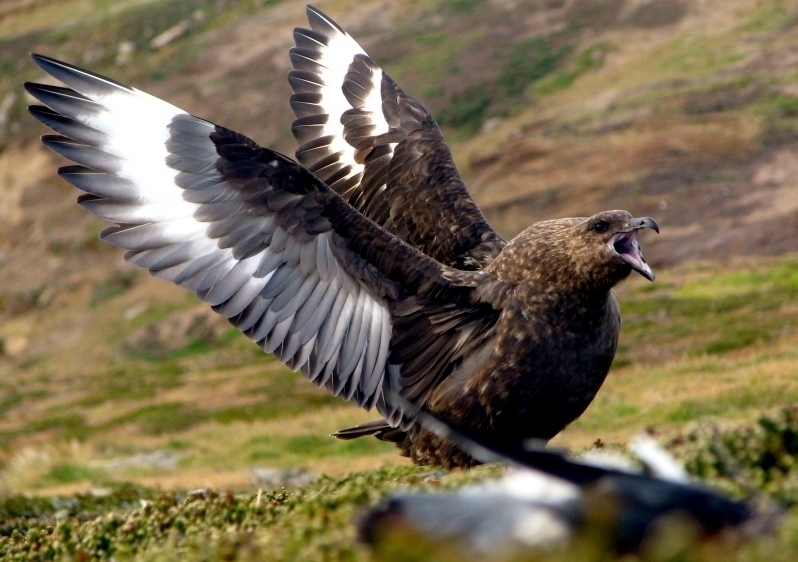 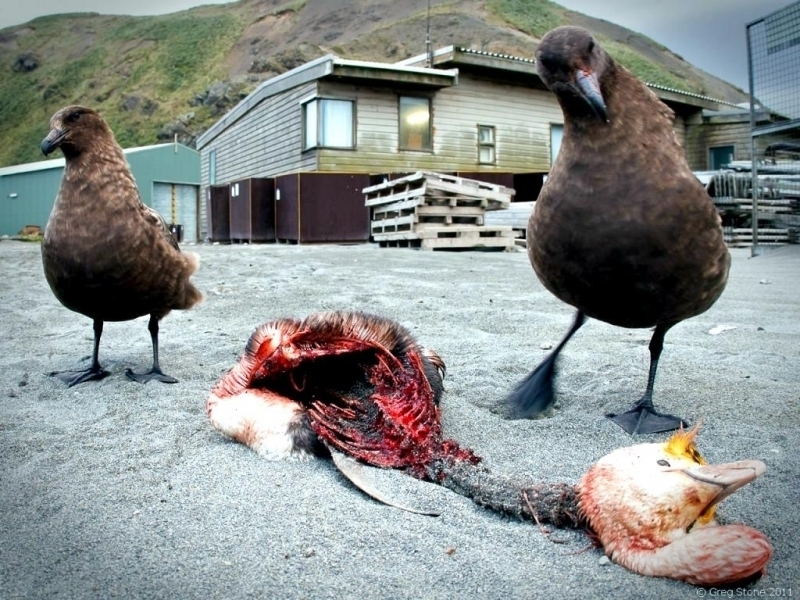 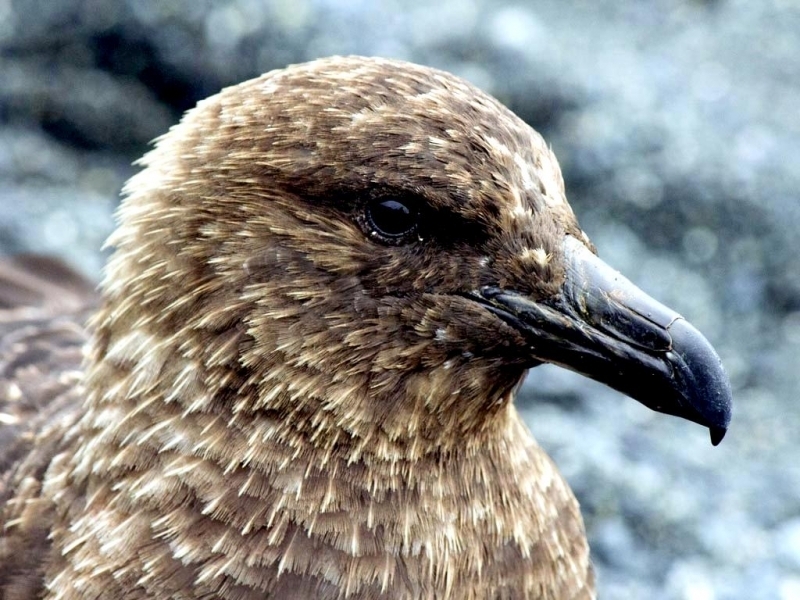 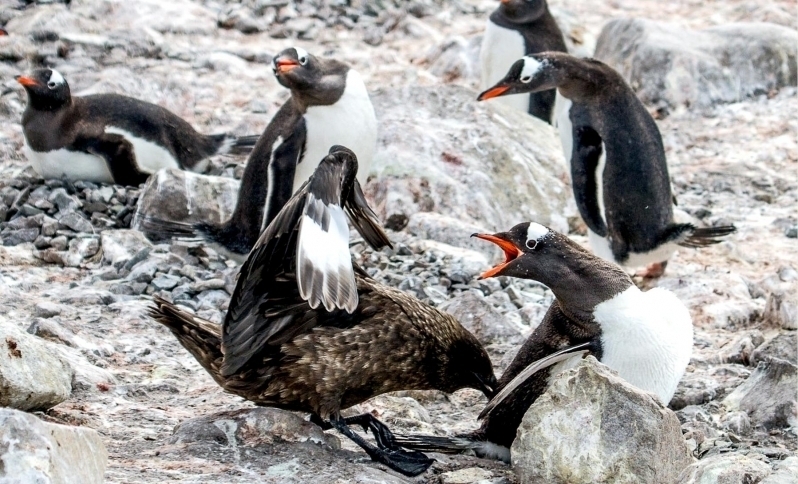 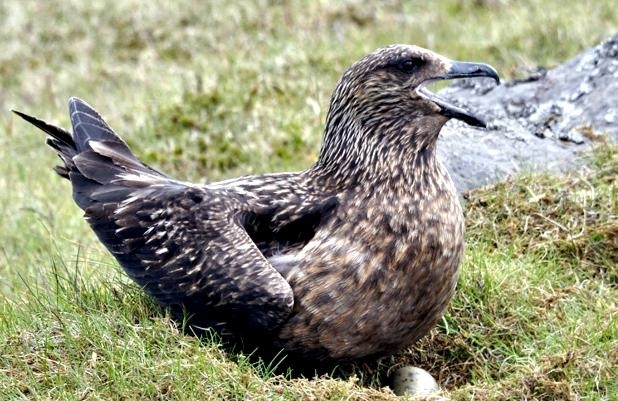 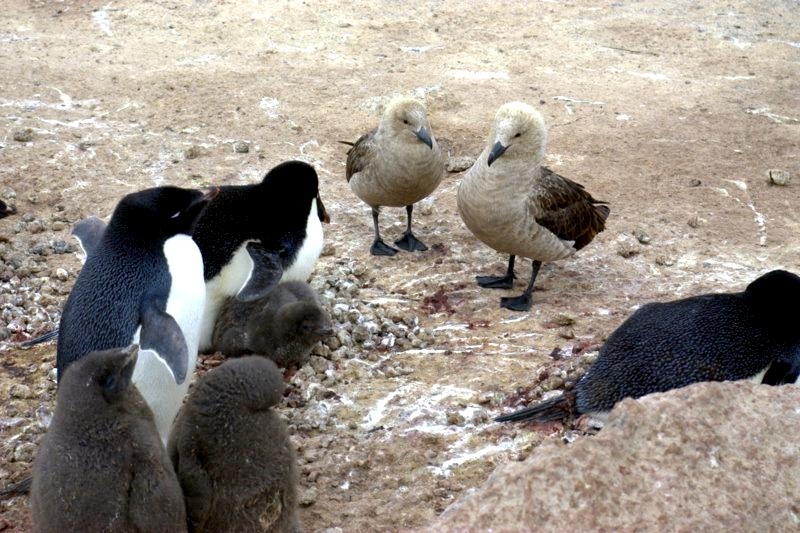 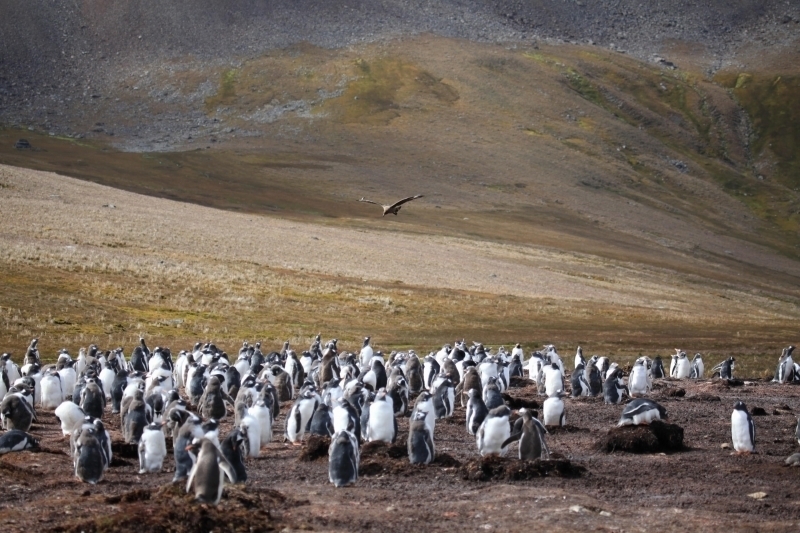 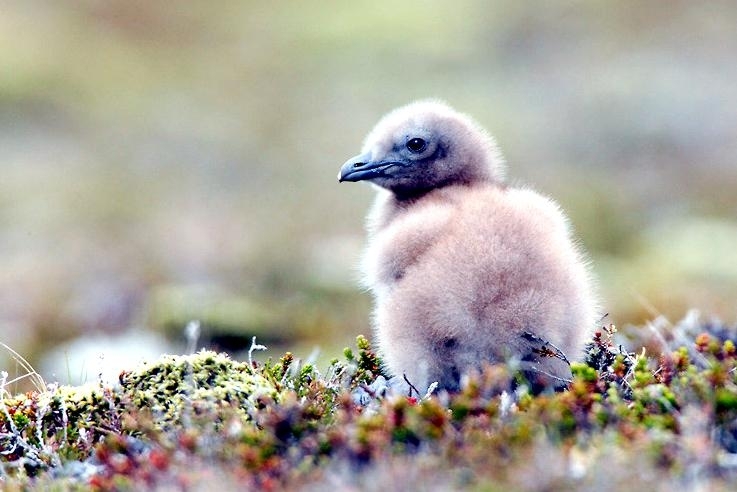 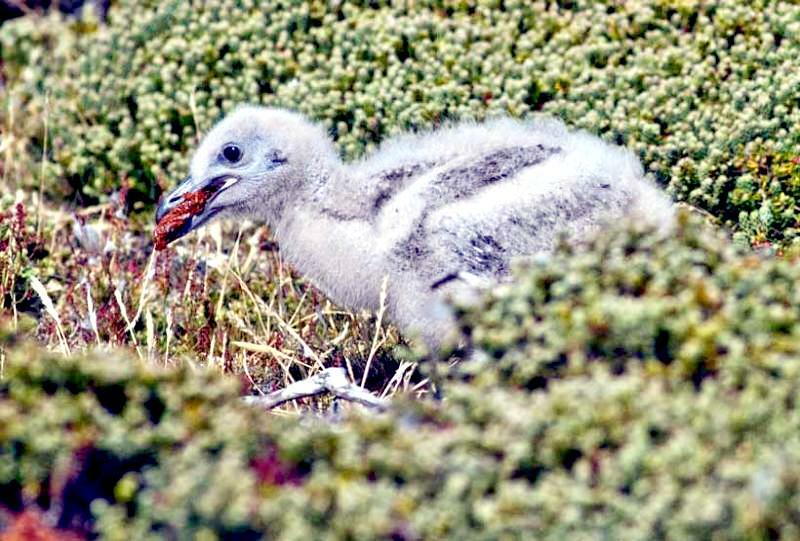 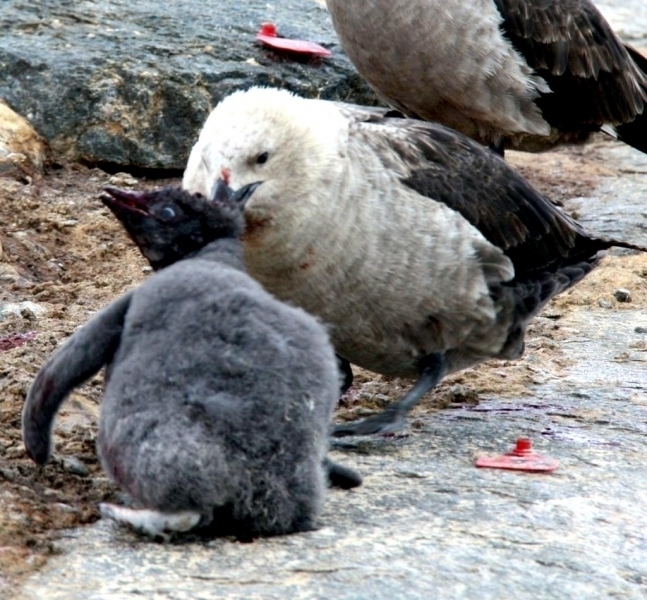 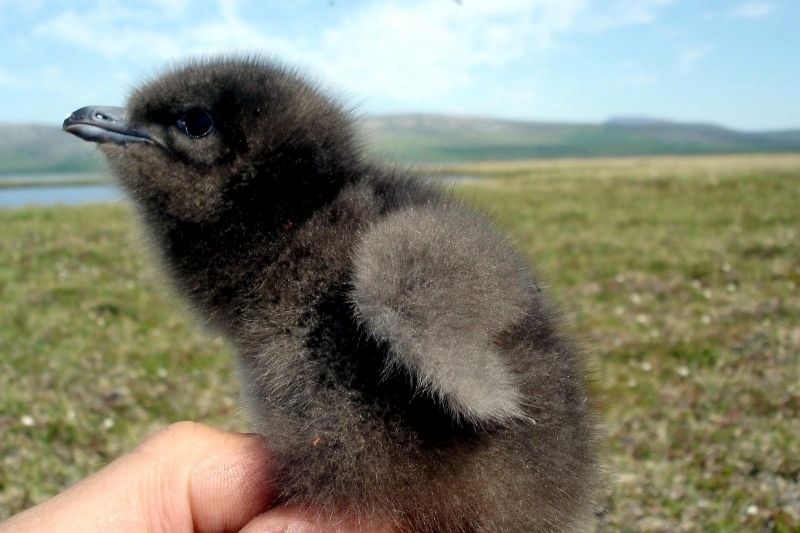 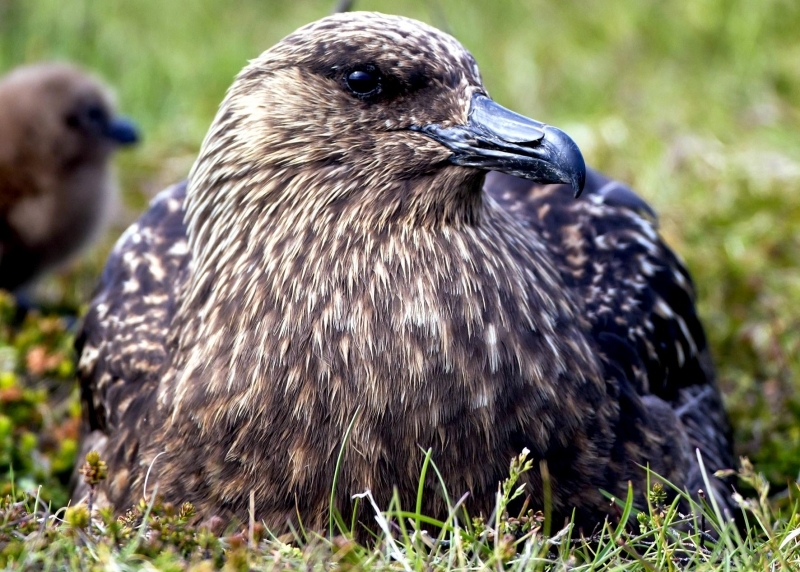 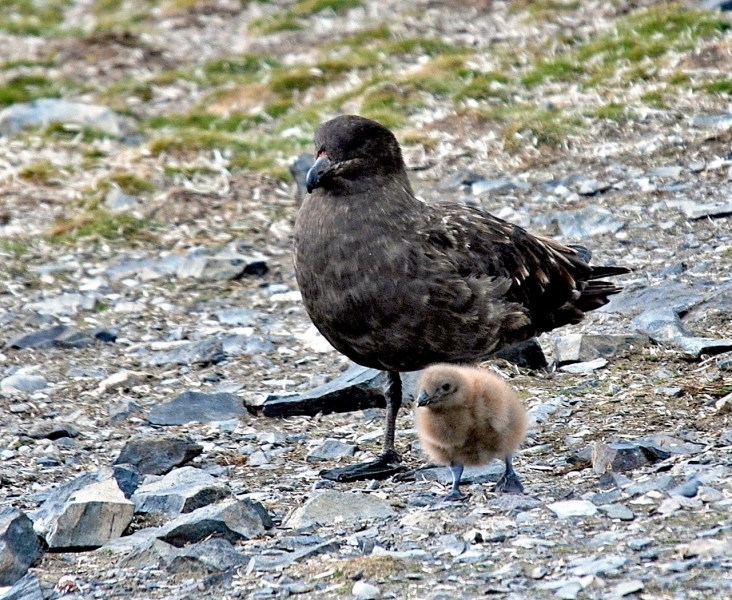 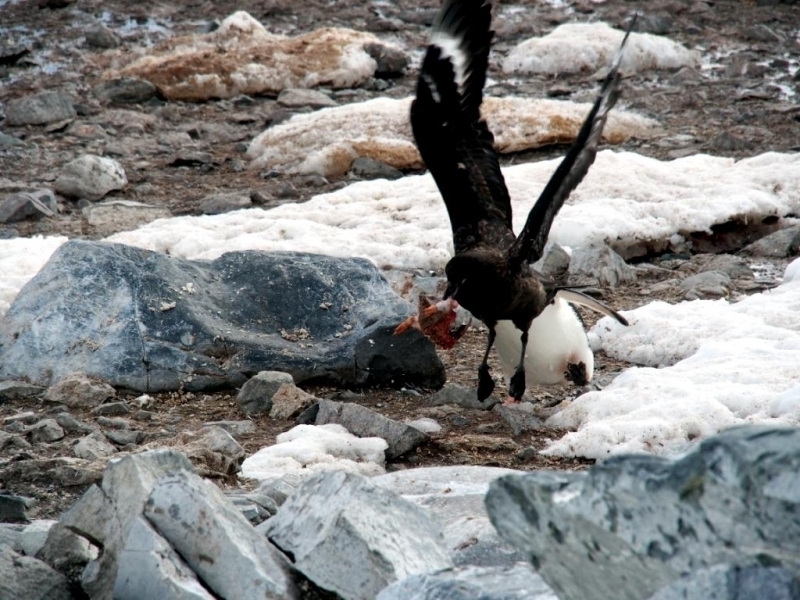 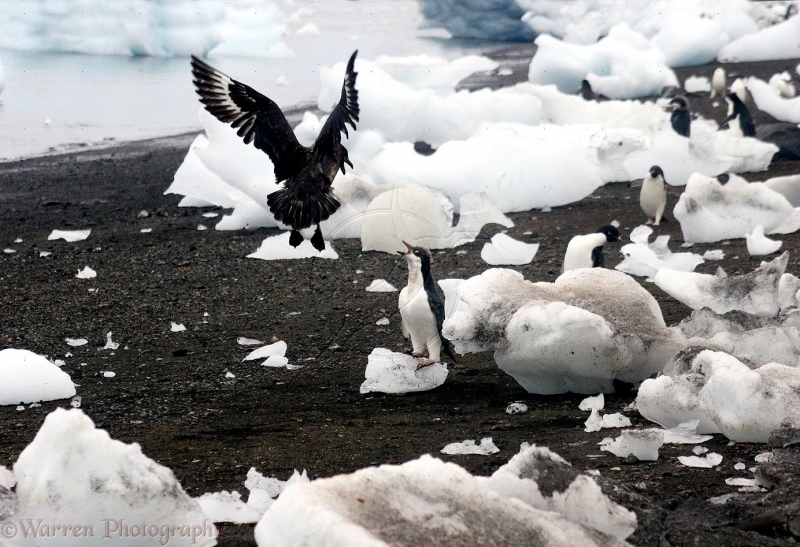 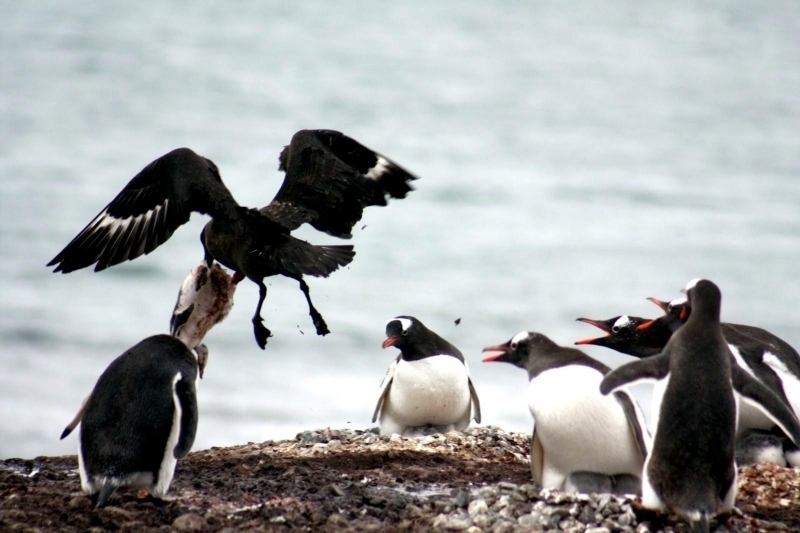 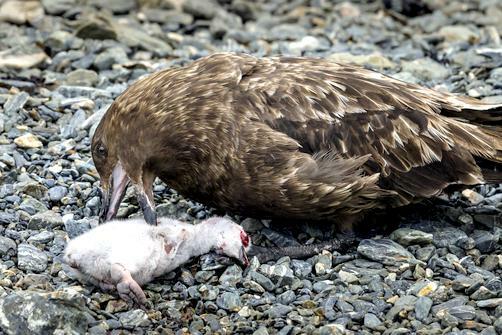 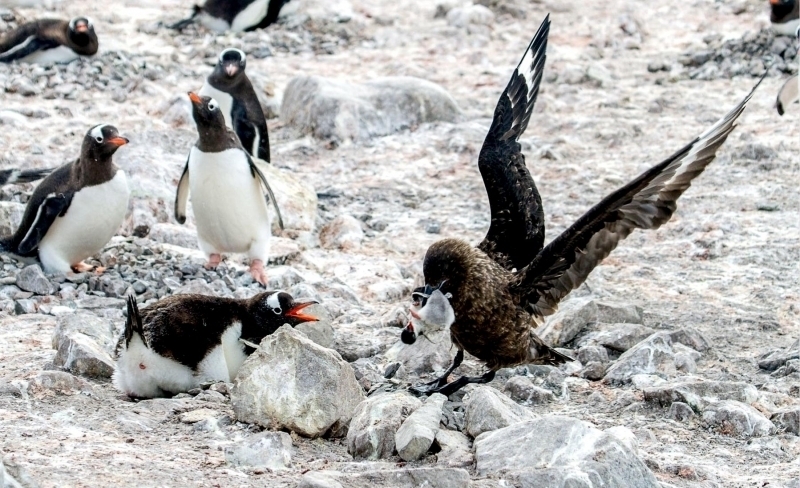 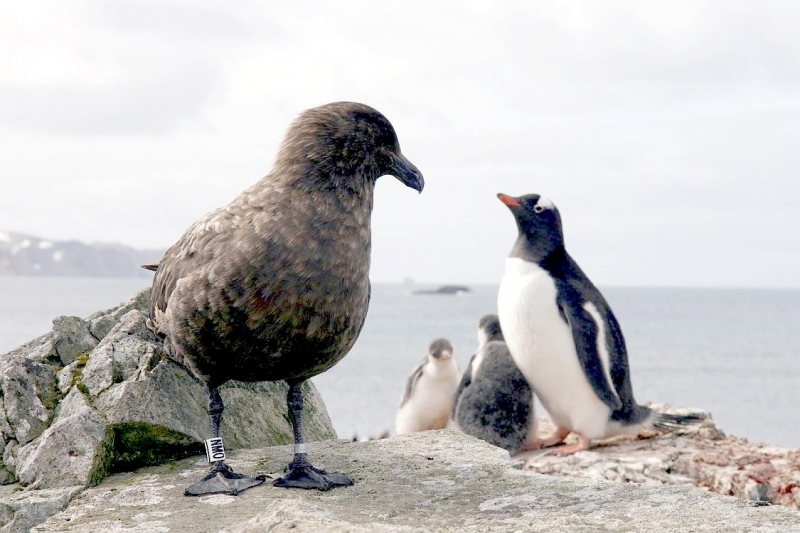 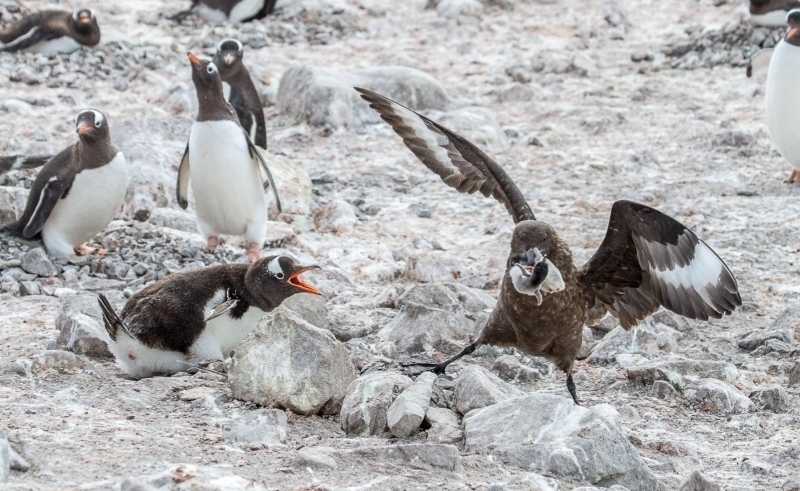 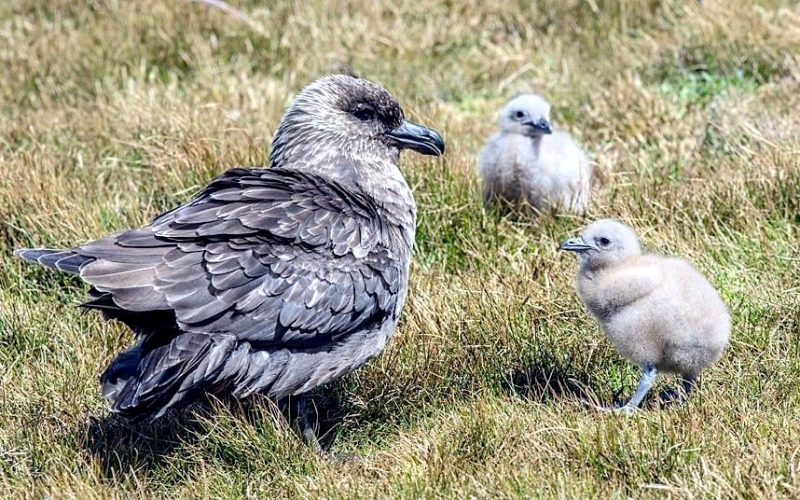 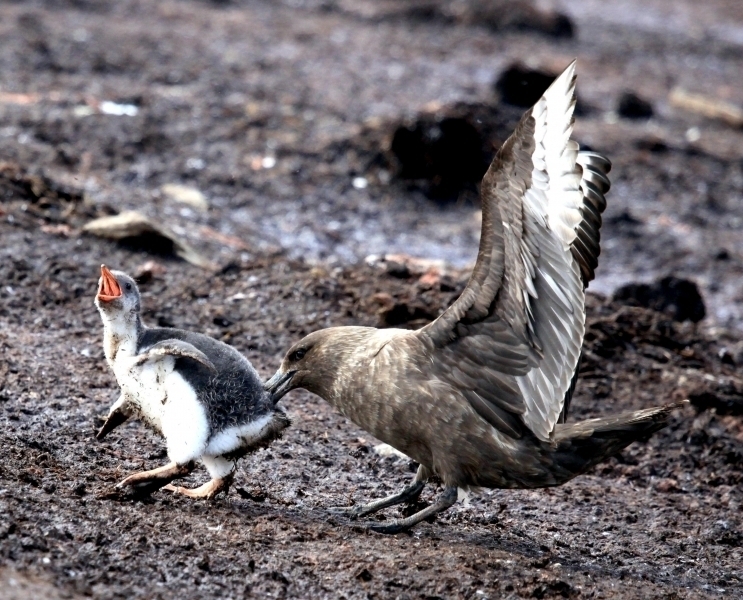 During the summer, Skuas stake territories near Adélie Penguin rookeries on the coast, raiding them for eggs, chicks and also cleaning up carrion, thus they have earned the nickname “Raptor of the South”. 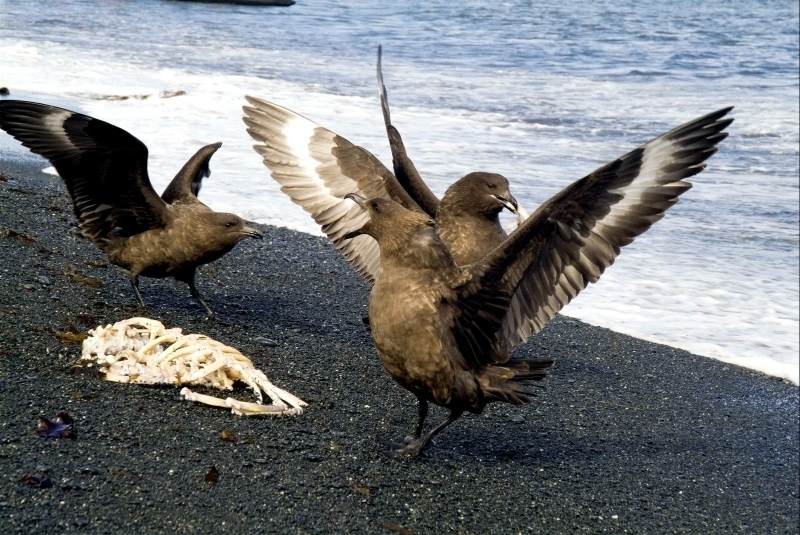 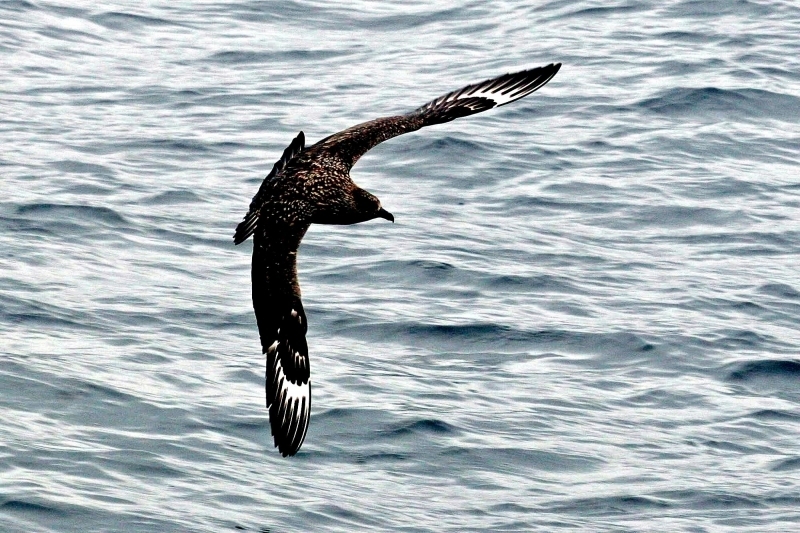 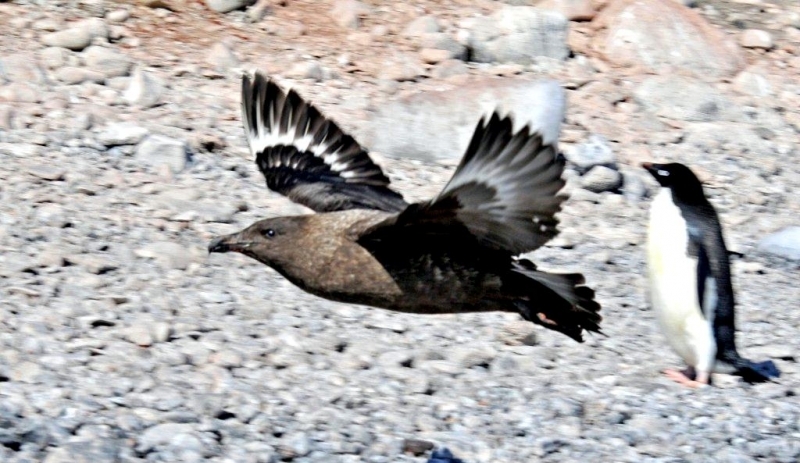 The diet of the Skua is more broad depending on season and their locality. 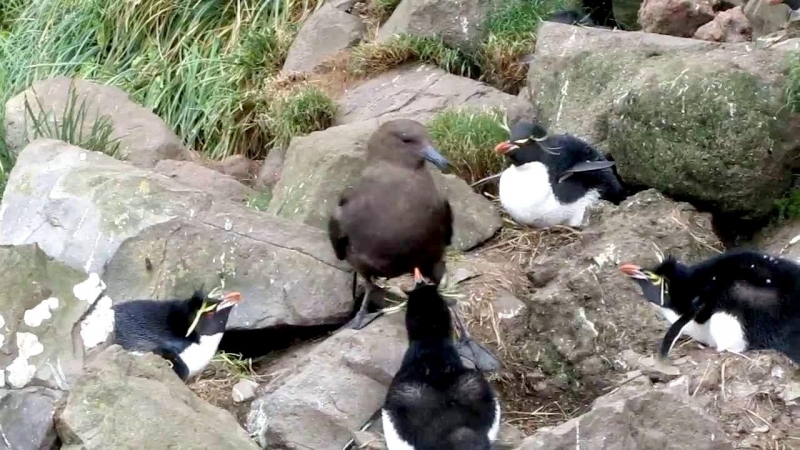 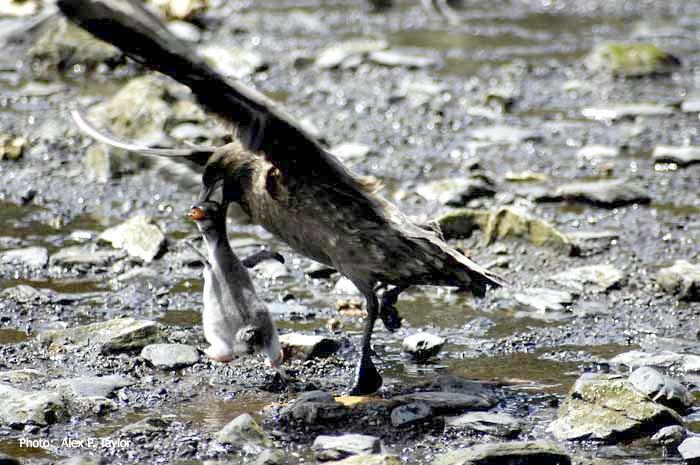 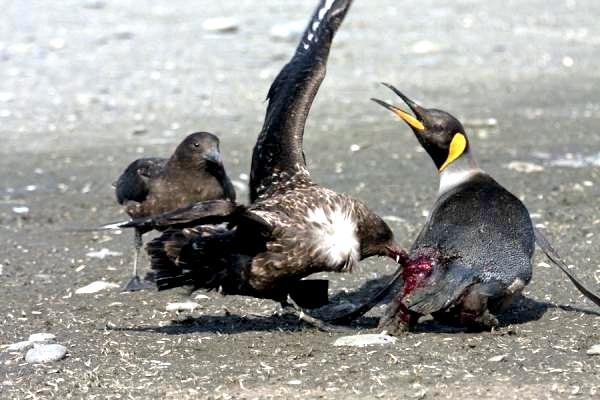 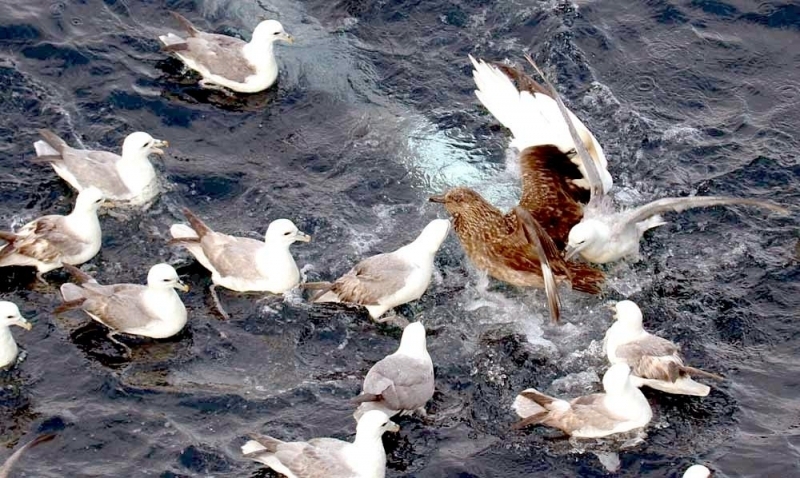 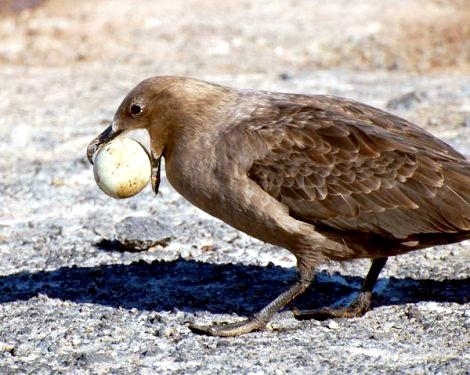 They may scavenge and predate upon other seabirds and their young & eggs or they may roam the southern oceans feeding on fish, mollusks, squid and crustaceans mainly krill & copepods. 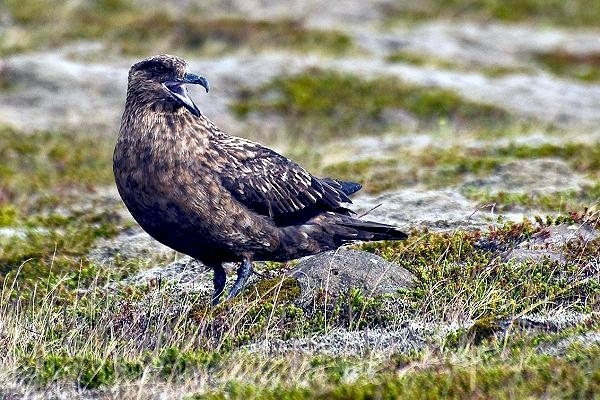 Skuas arrive at their breeding colonies in late October to mid-December. 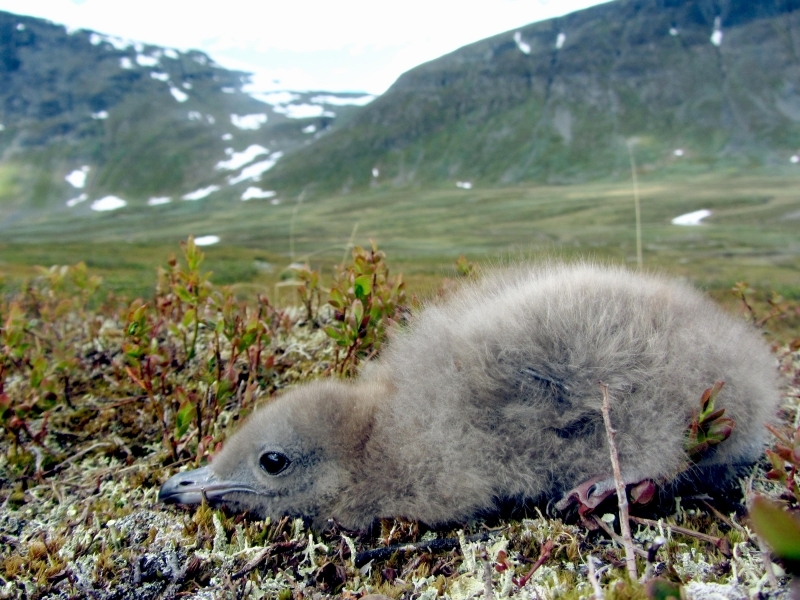 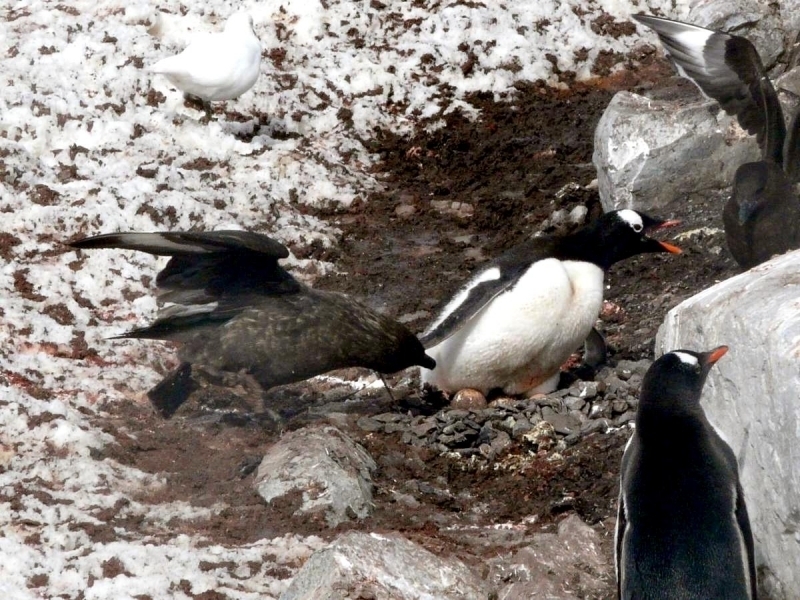 They nest in sheltered areas adjacent to penguin colonies. 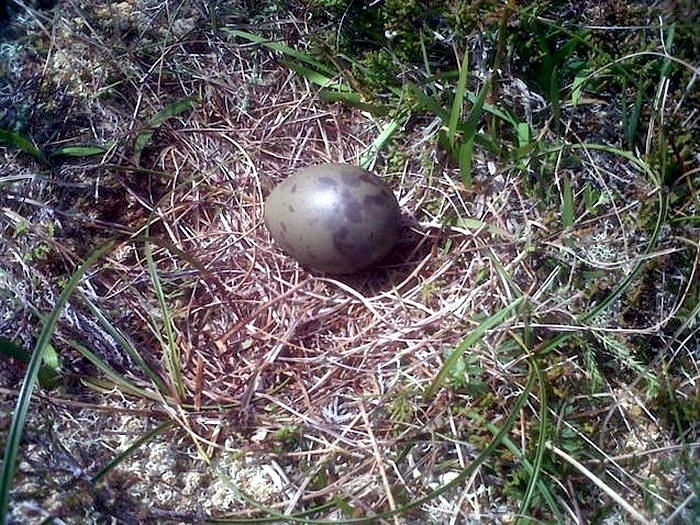 The nests are shallow depressions on the ground and are often found on rocky outcrops, moss covered cliff sides or valley floors. 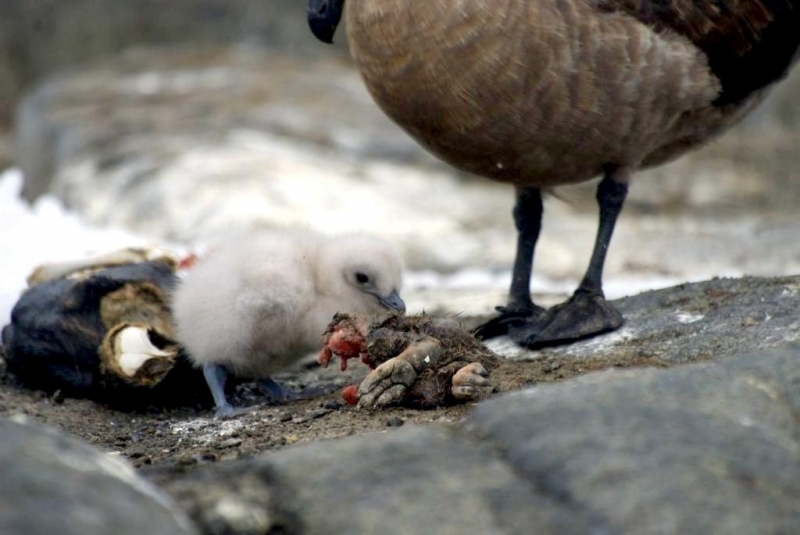 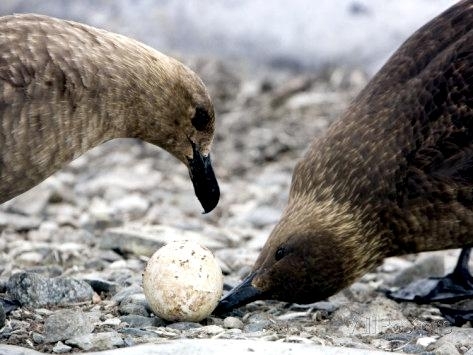 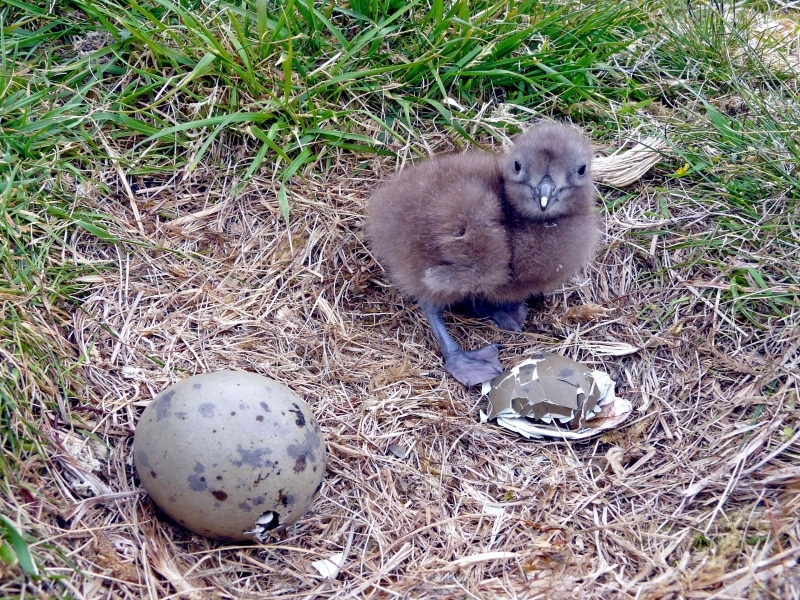 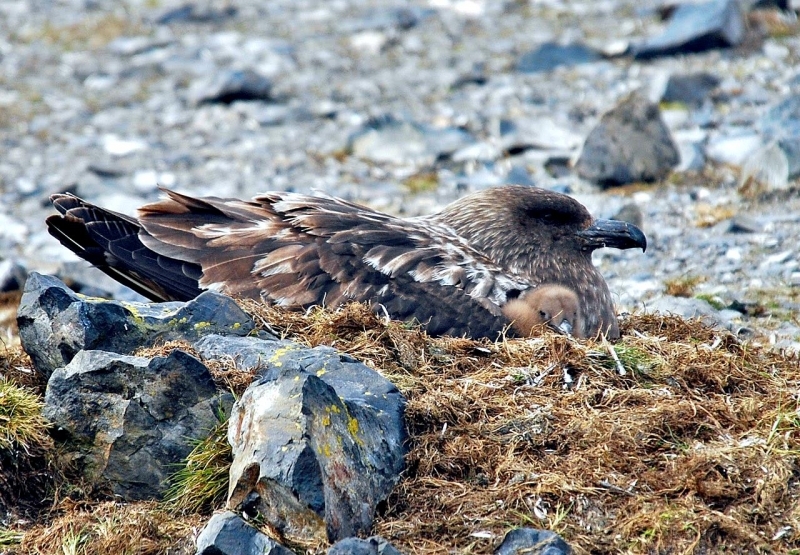 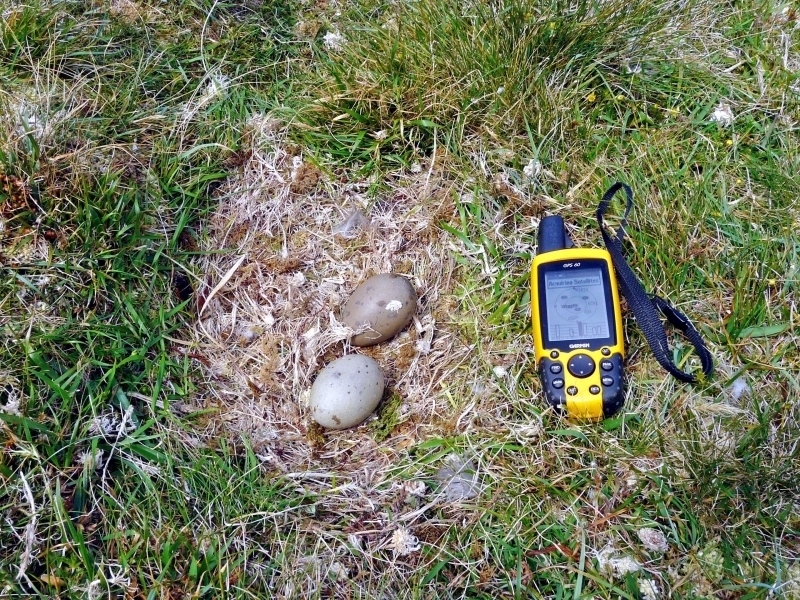 Skuas will generally lay 2 mottled eggs which hatch in late December to late January after an incubation period of 24 to 34 days.